Since the clots block blood flow to lungs, pulmonary embolism can be life threatening. However, immediate treatment can greatly reduce the risk of death. 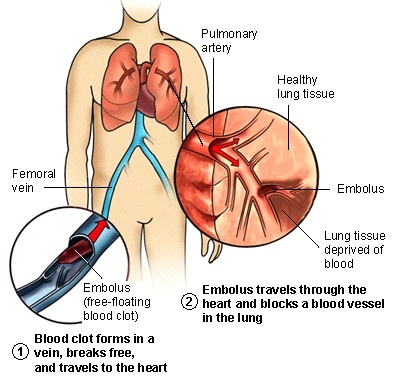 Taking measures to prevent blood clots in your legs will help protect you against pulmonary embolism. Pulmonary embolism symptoms can vary significantly, depending on how much of the lung is involved in the incident, the size of the blood clot, and whether you have any underlying lung or heart disease. Shortness of breath – This symptom can often immediately after the pulmonary embolism, and can get worse with traditional exertion. Chest pain – You may feel lie you have a heart attack the pain can become worse when you take deep breaths (pleurisy), cough, eat bend or stoop. The pain will get worse with exertion but won’t go away when you rest. Cough . A cough may produce bloody or blood-streaked sputum. Pulmonary embolism can be life-threatening. Seek immediate medical attention if you get unexplained shortness of breath, chest pain or a cough that produces a bloody sputum. In most cases, multiple clots are associated but not necessarily all occurring at once. The portions of lung severely each blocked artery are robbed of blood and may die. This is known as pulmonary infarction. This makes it harder for your lungs to provide oxygen to the rest of the body. Even though anyone can develop close blood ann subsequent pulmonary embolism, certain factors can increase your risk. If someone in your family has had venous blood clots or a pulmonary mobile in the past, you are at significant risk. This may be due to inherited diseases or disorders that can affect blood-making it more prone to clot. Heart disease, Cardiovascular disease specifically heart failure, makes a blood clot formation more likely. Cancer Certain types of cancer – especially ovarian, pancreatic, and lung cancers, as well as cancers with metastasis- can create levels of substances that help blood clot, and chemotherapy further enhances the risk. Women with an individual or family history of breast cancer or are taking, raloxifene or tamoxifen also is at greater risk of blood clots. Surgery is one of the leading causes of problems blood clots. For this reason, medication to prevent clots may be given before and after major surgery such as joint replacement. Long trips. Sitting in a cramped position during long car or plane trip slows down blood flow in the legs, contributing to formation fo blood clots. Smoking – for reasons that are not well-understood. Tobacco use predisposes certain individual to blood clot formation, specifically when they are combined with other risk factors. Being overweight. Excess weight increases the risks of blood clots – particular in women who smoke or have high blood pressure. Supplemental estrogen. The estrogen in hormone replacement therapy and birth control pills can increase clot factors in your blood, specifically if you smoke or are overweight. Pregnancy, The weight of the baby pushing on veins in the pelvis can slow blood return from the legs. Clots are more inclined to develop when blood slows pools. Pulmonary embolism can also lead to pulmonary hypertension, a deficiency in which the blood pressure in your lungs and on the right side of the heat is too high. When you obstructions in the parties inside your lungs. Your heart must work extra hard to push blood through that vessel. This increases the blood pressure within these vessels and the right side of the heart, which can weaken your heart. In rare cases, small emboli occur commonly and develop over time, resulting in chronic pulmonary hypertension, known as chronic thromboembolic pulmonary hypertension. Your doctor may request a blood test for the clot -dissolving substance D-dimer. High levels may suggest an increased likelihood of blood clots, although other factors can also cause high D-dimer levels. The noninvasive shows images of your heart and lungs on film. Although X-rays can diagnose pulmonary embolsm and may even appear normal when a pulmonary embolism exist, they may rule out conditions that mimic the diseases. A noninvasive test know as duplex ultrasonography (sometimes called duplex scan, or compression ultrasonography) use sound waves to check for a blood clot in your thigh veins. IN these test known as duplex ultrasonography (sometimes called duplex scan, or compression ultrasonography) uses sound waves to chek for blood clots in your thigh veins. In these test, your doctor uses a wand shape devices called a transducer to send the sound waves to the veins being tested. These waves are then reflected back to the transducer and rendered into a moving image by a computer. The absence of cost reduced the likelihood of DVT. If the upper thigh vessels are clear, the ultrasonography will also can the veins behind the knee looking for ridicule closed. If cost is present treatment likely will be started immediately. In a spiral or helical CT scan, the scanning device will rotate around the body in a spiral motion, much the same way the strip occurs on candy. The scanning devices develop 3-D images. This CT scan can deck abnormalities that exist inside the arteries within lungs, with much more accurate measurement and precision than the convention CT scans. In certain cases, the contrast material is injected intravenously during the CT scan to help outline the pulmonary arteries. This test presents a clear picture of the blood flow inside the parties of the lung. 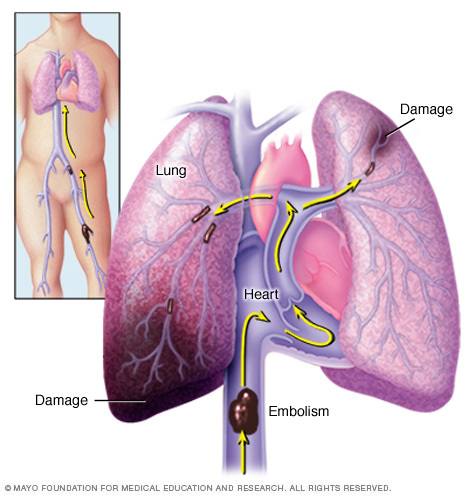 It is the most accurate way to diagnose pulmonary embolism. Due to that fact, it requires a high level of skill to administer this test along with potentially serious risk. It is usually the last option performed when other tests fail to provide a clear diagnosis. 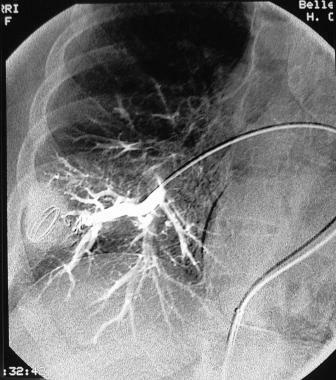 In a pulmonary angiogram, a flexible tube ( or catheter) is inserted into a large vein, usually in your growing, and treated through into your heart and on into the pulmonary arteries. A special dye is inserted into the catheter, and X-rays are taken as the dye travels along the parties in your lungs. MRI scans use radio waves and strong magnetic fields to produce a detailed image of internal structures. Due to the expense of MIR, ist usually reserved for pregnant women to avoid radiation going to the fetus and people whom usage of dyes may harm kidneys in other types of test. 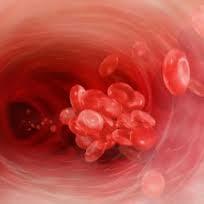 The primary goal of treatment is to keep blood clots fro getting bigger and prevent new clots from developing. Quick treatment is imperative to prevent serious complications and death. Blood thinners anticoagulants – The medications prevent new clots from developing while the body works to break up the existing clot. Heparin is frequently prescribed anticoagulant that can be injected into the vein under the skin. It often acts quickly and overlapped for several days with an oral anticoagulant, such as warfarin, unit it became effective, the time can take up to few days. 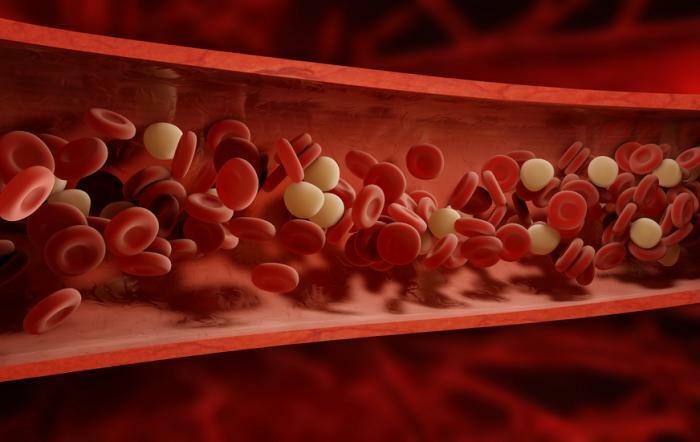 A new class of anticoagulant drugs also known as novel oral anticoagulants (NOACs) has been tested and approved for treatment of venous thromboembolism as well as pulmonary embolism. These drugs work very quickly and have fewer interactions with other medications. Some NOACs have the advantaged of being taken through the mouth without the need to overlap heparin. However, all anticoagulants have side effects in which bleeding is most common. Clot dissolves (thrombolytics) while clots usually dissolve in their ow there is medication given through the vein that can dissolve more quickly. Because these clot-dissolving drugs can cause sudden and severe bleeding that are typically reserved for life-threatening circumstances. Clot removal – If you have an extremely large, life-threatening clot in your lung, your doctor may recommend removing it with a catheter, which is a thin flexible tube that is threaded through your blood vessels. Vein filter – A catheter can be used to position a filter in the body’s main vein, called the inferior vena cava, that lead from the left to the right side of your heart. This filter can help keep cost from being carried into your lungs. This procedure is typically reserved for people who can not take anticoagulant drugs or when anticoagulant medications do not work well enough or fast enough. Some filters can be removed when they are no longer needed.